Get reliable service without added fees or dropped calls. 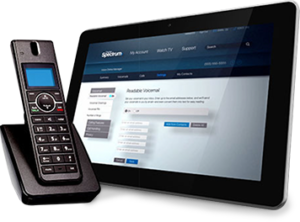 Charter Spectrum Voice provides much more than just being able to talk all you want. As well as unlimited local and long distance calling, Spectrum Voice includes over 18 of the most popular phone features. Calling the world doesn’t have to cost a lot. Spectrum Voice offers everyday rates as low as 3c per minute. Or you can add our Worldwide 250 Calling Plan, and get 250 minutes to 195 countries, including 78 mobile destinations for only $20 a month. In case of emergency. Spectrum Voice provides enhanced 911 services, much like traditional phone companies, to help emergency personnel quickly respond. Additionally, Spectrum Voice will also work with most monitored home security systems. Spectrum Voice will also work during a power outage with the appropriate backup battery installed. (Charter Spectrum provides an optional backup battery for an additional cost.) This battery will provide up to eight hours of standby and five hours of talk time to provide you with Spectrum Voice services even during a power outage. The point is, you can’t rely on you cell phone alone to help keep your family safe.